The reason I started this blog in the first place was to find people I could relate to. Anytime I searched “social anxiety” on Google, all I could find were medical articles by doctors who listed the clinical symptoms of social anxiety and nothing about them were at all relatable. Sure, I mean I get all of the symptoms and it all fits but I needed to read that I wasn’t the only one who went for a pee 5 times before leaving the house and that I wasn’t the only one to hide from the postman. 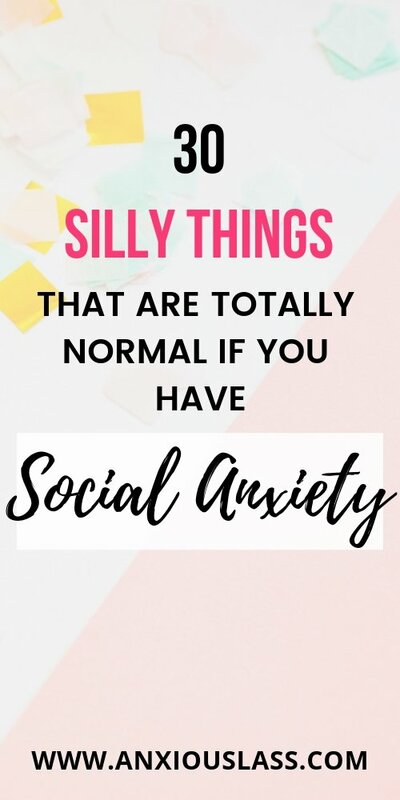 I needed to laugh at myself by relating to other people feeling silly and embarrassed about what they’ve done because of social anxiety and I needed to know that the things I do are normal for social anxiety and not just because I’m an oddball! 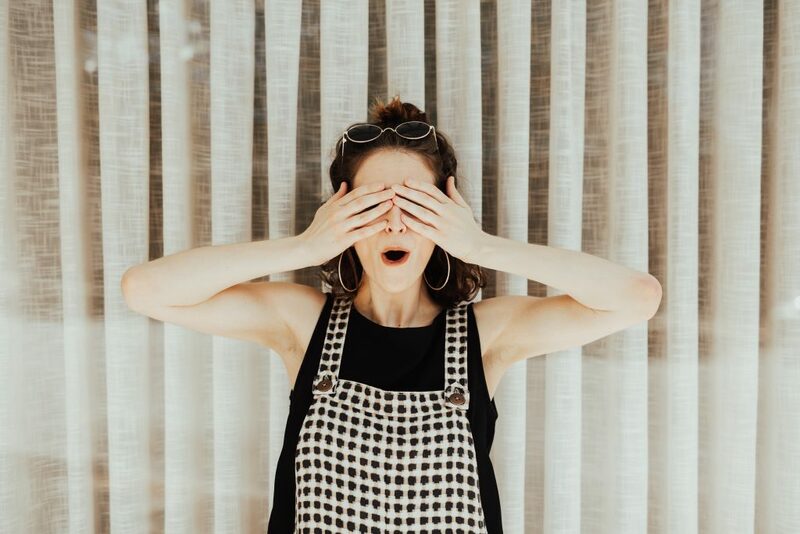 So I’ve listed some of the things that are totally normal when you have social anxiety in hope that you can feel related to! Pretending your texting to look busy. Checking that no one is on the street and your neighbours aren’t outside their house before you open the front door. Closing the front door again just after opening it because you heard a car. Holding your pee until the person in the toilet cubicle next to you leaves. Getting really anxious because you’ve imagined an entire unrealistic scenario in which you’re doing something super embarrassing. Thinking of something funny but leaving it too late to say it out loud. Hiding in the toilet to get away from socialising. Coming up with the most ridiculous excuses to get out of plans. Always doing something with your hands because you don’t know where to put them when they’re still. Darting your eyes around a room so that you don’t accidentally stare at anyone and then getting a bit dizzy. Saying “you too” when someone wished you happy birthday because you were put on the spot. Looking at pictures of the restaurant you’re going to on Google, to see if you can see where the toilets are or where you may end up sitting. Preparing every possible thing you might have to say before going into a social situation. Pretending that you’re not hungry when someone tells you to “help yourself”. Going all day without a drink at a friends house because you’re too anxious to ask for one. Not being able to listen to your headphones at full volume in public in case you accidentally breathe too loud. Practising your take-away order about 10 times before going up to the counter. Re-reading your emails dozens of times before sending them. Deleting Facebook statuses before posting because you think no one will comment or like. Zoning out when too much is going on at once. Suddenly thinking about something that you said or did 10 years ago and having an anxiety attack. Always forgetting to ask the handyman if they want a cup of tea because you’ve already hidden from them. Which food to order is usually dictated by whether you can order online instead of speaking on the phone. Watching your phone ring and waiting for it to go to voicemail. Pretending you haven’t seen someone that you know walking towards you in case you clock them and they don’t recognise you. Getting upset that your friends haven’t invited you out but when they do, you cancel or say you can’t go. Thinking that every single person in a coffee shop or restaurant is looking at you and judging you. Feeling relieved when you come down with a virus, so you don’t have to leave your house. Giving awkward handshakes/hugs because you don’t know how to greet someone. Do you do any of the things on this list? What silly things do you do because of your social anxiety? I really like your posts. They speak to me in my language. I especially like your hopeful tone. You radiate positivity . I have a blog: https://www.mentallyinteresting.com and I would love if you would do a guest post. I really liked your posts on Hope and Anxiety and Silly Things We Do With Anxiety. YES!!!!!! I do most of these things! Lol. In fact, just the other night, someone said, “What’s up?” Of course, this is a question I never know how to answer. Do I tell them what I’m doing? I think people say it as if they’re just saying hi, but to me it means, what are you up to? Lol. I quickly replied, “Good! How are you?” 😂 I enjoyed reading your list. It made me laugh because it’s so relatable! Thanks for sharing! ohh I get this too. Where I used to live, people say “alright” as a greeting but here it’s a question and I never know whether to say “yes I’m good thanks” or “alright” back haha. This is so relatable. Perhaps number 16 is more common than I realise but reading that someone else does this is somehow reassuring. Thank you very much for sharing! Thank you for reading! and yes I totally realised I did number 16 after travelling on trains a lot haha!